Celebration: “The Gathering Of The Lost” Makes The David Gemmell Legend Award Shortlist! Supernatural Underground Giveaway For “The Gathering Of The Lost”: We Have A Winner! “The Gathering Of The Lost” Makes The Gemmell Legend Award Longlist! What’s Coming Up: “The Gathering of the Lost” Mass Market Release in the UK,That’s What! The Heir of Night Wins — Yes, Wins! — the 2012 Gemmell Morningstar Award! Counting Down To “The Gathering of the Lost” — Now Only 3 Days To Go! The Gathering of the Lost Cover UK—Revealed Now on Orbit! Coming Very Soon: ‘The Heir of Night’–UK Mass Market Edition, Plus New Cover Feature! “Kind van de Nacht” Is Here! Orbit & Harper Voyager Celebrate “The Heir of Night’s” Vogel Success; Plus, the “Grand Giveaway” Reminder! 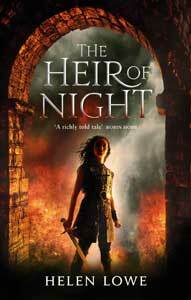 Here It Is—the UK Cover for “The Heir of Night”! Even More Australia/New Zealand Cover Excitement! More Australia/New Zealand Cover Excitement! “Thornspell” is Out In Paperback Today! “The Heir of Night” ARE’s Are Here! Thornspell: Here in Paperback July 2!